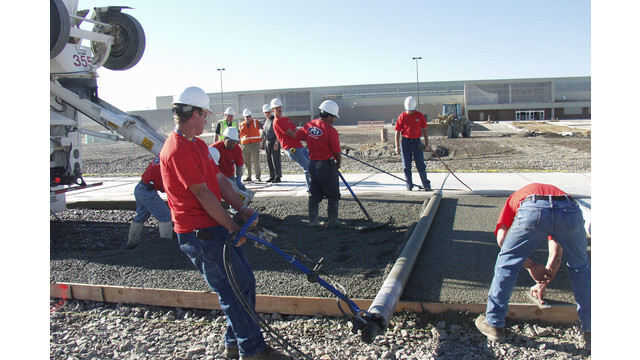 A pervious concrete pour is a three-step process – placing to elevation, compaction and curing. Unlike traditional concrete which looks for a smooth, finished surface, pervious concrete contractors strive for compaction, aggregate interlock and a porous surface. Like traditional concrete, there are many different methods and equipment for pouring pervious concrete. However, since pervious concrete is a low-slump mixture, it cannot be pumped into place like traditional concrete. The most common methods of placement are directly from a ready-mixed truck, with a concrete buggy or by conveyor. Pervious concrete is commonly poured in formed-out strips, says Dale Fisher, CEO of PCI Systems, LLC. Strips are poured every other to allow the pervious the proper amount of curing time. Current documents specify contractors pour strips between 12 and 20 feet wide. However, this can be a challenge when pouring very large areas that have tight scheduling deadlines. New equipment, such as laser screeds, allows contractors to pour larger areas without strips for situations like these. Some pervious concrete can be placed with a concrete slipform paver. Slipform pavers do not use forms when pouring, so Fisher says most pervious placements using this equipment is done on slabs that do not need a definite straight edge, such as trail pathways. Typically, there is one crew member near the ready-mixed truck’s chute (or by the buggy or conveyor) directing the pervious concrete where it should go. The screed operators are the next in line, screeding the pervious concrete to the proper elevation and compacting it. Contractors can use roller, truss or laser screeds with pervious concrete. Plate compactors can be used instead of screeds, but a plate compactor may not provide the same consistency of compaction that screeds can, Fisher says. Contractors also need to avoid over-compaction when using plate compactors. The screed is followed by the finishing crew, which has multiple jobs. After screeding the pervious, it needs to be cross rolled. Typically, one crew member follows behind the screed with a cross roller, rolling in a perpendicular direction to the screed. Cross rolling gives the finish a nice continuity, Fisher says. Joints are also placed during this stage. Fisher says they are placed just like traditional concrete joints by either using a roller jointer while the pervious is still wet or sawing the joints after it has cured. The final finishing crew members follow with hand floats to touch up the edges. “Don’t use trowels because trowels tend to damage the surface,” Fisher says. He adds that edging is not encouraged with pervious concrete. “When the pervious concrete is wet the ‘paste’ sticks together. But when it’s dry it doesn’t. Once that paste has gone from its plastic state to a dry paste it loses its bond. If you were to edge it when it was dry all the aggregate is going to ravel off,” Fisher says. A pervious concrete pour is also affected by external environmental factors. The ideal environment for a pervious placement is moist, cool and wet, Fisher says. “A drizzly day is perfect to pour pervious concrete because you can double your time for pervious placement,” Fisher says. A hot and dry environment will make the mix dry quicker, shortening the window of working time. If hot weather is inevitable, Fisher suggests pouring early in the morning or overnight. Fisher says pervious concrete can be placed in temperatures ranging from 40 to 90 degrees Fahrenheit. Temperature isn’t the only factor to consider. Humidity also plays a roll. No humidity will cause the pervious concrete to dry out faster, Fisher says. A hydration stabilizer admixture is critical when pouring in dry, hot environments, he adds. And when it’s cold, Fisher tells contractors never to batch the pervious concrete with hot water. “The hot water is going to dry up too fast and the pervious won’t have sufficient moisture for proper cure,” he points out. Curing pervious concrete helps hold in moisture to allow full hydration. And since pervious is a porous concrete, the top 1 to 11/2 inches are critical when it comes to proper curing, Fisher says. An improper cure may result in raveling on the top or the edges of the slab. Plus, improper curing will prevent the pervious concrete from reaching its desired properties and strength. Although an improper cure does not mean the pervious concrete is sure to fail, it does greatly increase the chance for failure. Pervious concrete needs to be covered while it still has a glistening sheen, Fisher adds. The edges need to be covered, too. Fisher says pervious concrete should have a “Tupperware” seal covering the entire slab. The plastic should remain on the slab for seven days. That time should be increased to 10 days or more if fly ash or other supplementary cementitious materials are used in the pervious mix, Fisher adds. Although the ASTM standard for pervious concrete curing does not specify a recommended thickness for the plastic sheeting, Fisher says the norm right now is a 6 mil plastic. A plastic this thick can raise some concerns. For one, it means there is more plastic going to the dump after the pervious concrete has cured, Fisher says. Also, the thicker plastic is susceptible to lots of wrinkles when it is placed over the concrete. That leaves space for any wind to reach under the plastic and even lift it up during the curing process. Fisher suggests using a thinner plastic because it is more likely to stay down when placed on the pervious. Pervious concrete is considered a greener product than traditional concrete. But the need for plastic during curing may not be the greenest process. Fisher points out that perhaps the biggest need in pervious concrete is alternative curing methods. Currently he says there is not much research for alternative methods, but he expects that will change in the future. Internal curing admixtures help in the curing process. At this point they do not serve as a replacement for the plastic, but they do allow for use of a thinner plastic. The internal curing admixtures also serve as risk management in case the plastic accidently blows off the concrete during the curing process. Hydration Stabilizer. A hydration stabilizer admixture helps slow the setting time of pervious concrete, resulting in another 10 to 15 minutes of working time during the placing process. Viscosity Modifier (VMA). A viscosity modifier admixture acts like a paste thickener for the pervious concrete mix. It allows for an increase in the water/cement ratio without making the paste too thin. Water Reducer. A water reducer reduces the amount of water in the mix while maintaining the slump. This type of admixture gives the pervious concrete a slickening affect. It can also act as a hydration stabilizer.